What is the SSID of the connected network and which message is displayed in the browser window? SSID: Home-Network Message: Good job! SSID: Home-Net Message:Congratulations! You were able to connect it! A administrator wishes to extend the range of the existing IEEE 802.11n network without changing the AP. What can the administrator do to accomplish this? Deploy a Wi-Fi Range Extender. Upgrade the firmware on the AP. 3. Which security mode is the least secure choice when a home wireless router is configured? 5. Which organization certifies vendors for adherence to the 802.11 standards to improve interoperability of 802.11 products? 6. Which feature of 802.11n wireless access points allows them to transmit data at faster speeds than previous versions of 802.11 Wi-Fi standards did? 7. Which type of wireless topology is created when two or more Basic Service Sets are interconnected by Ethernet? 9. What type of wireless antenna is best suited for providing coverage in large open spaces, such as hallways or large conference rooms? 11. What is the purpose of the Distributed Coordination Function in an IEEE 802.11 WLAN environment? It is used to send data over a half-duplex connection. It is used in a full-duplex environment to detect collisions. It allows a client to detect whether or not a channel is clear prior to transmission. It allows the client to change transmission channels. 12. An employee connects wirelessly to the company network using a cell phone. The employee then configures the cell phone to act as a wireless access point that will allow new employees to connect to the company network. Which type of security threat best describes this situation? 13. During which stage of establishing connectivity between a WLAN client and an AP does the client learn the MAC address of the AP? 14. Fill in the blank. Do not use abbreviations. Ad hoc wireless topologies sometimes can use a feature called (tethering, TETHERING) to enable a smartphone to create a personal hotspot. It is the best way to secure a wireless network. It provides free Internet access in public locations where knowing the SSID is of no concern. 16. A student uses a laptop to upload an assignment to a file server. Which wireless frame type did the laptop send to locate and associate with the campus access point? 17. Which type of management frame may regularly be broadcast by an AP? 18. A company has recently implemented an 802.11n wireless network. Some users are complaining that the wireless network is too slow. Which solution is the best method to enhance the performance of the wireless network? 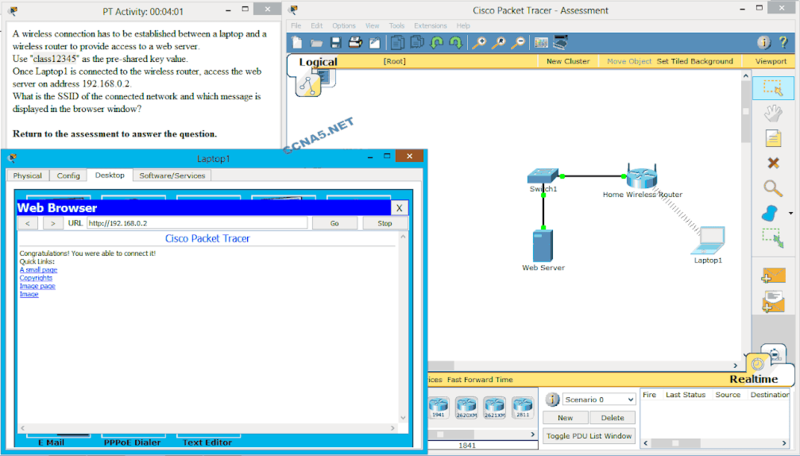 Disable DHCP on the access point and assign static addresses to the wireless clients. Replace the wireless NICs on the computers that are experiencing slow connections. Split the traffic between the 2.4 GHz and 5 GHz frequency bands. Upgrade the firmware on the wireless access point. 19. For which discovery mode will an AP generate the most traffic on a WLAN? 20. Which statement defines the control frame operation between two stations? A station sends an RTS frame as the first step in a three-way handshake that is required before sending data frames. 21. What is a difference between Cisco APs that operate in a home environment and Cisco APs that operate in a corporate environment? Some corporate AP models can operate in either autonomous mode or controller-based mode. Controller-based APs are used in the corporate environment, and they are server-dependent devices that require an initial configuration to operate. Cisco corporate APs do not support PoE. AN AP connected or enabled by an attacker to capture client data in transit. A series of cyclic dissasociate commands that causes all clients in the BSS to disconnect. A repeated flood of the BSS with clear-to-send frames to a bogus client. The AP send a challenge text to the client. The AP authenticates the client. The client sends an authentication frame to the AP. The client encrypts the message. The AP decypts the message. 24. Fill in the blank. Use the acronym. 25. A WLAN user wants to allocate an optimal amount of bandwidth to a specific online game. What is a Linksys Smart Wi-Fi tool that will allow the user to do this? 26. Which parameter is commonly used to identify a wireless network name when a home wireless AP is being configured? 27. A supervisor needs wireless access in the construction office during the construction of a new building. The construction office is in the new building and directly across the road from headquarters. What could be used to satisfy this requirement of needing a narrow area of coverage? 28. Which IEEE wireless standard is known as WiGig and operates using a tri-band solution in the 2.4, 5, and 60 GHz ranges? 29. Fill in the blank. A network administrator discovers a rogue AP in the network. The rogue AP is capturing traffic and then forwarding it on to the legitimate AP. This type of attack is known as a (man in the middle, MAN IN THE MIDDLE)attack.